In my previous post on this blog, I wrote about the top-secret announcement from ACube Systems. Today it’s the 19th of September and the secret has been revealed! Bassano del Grappa (Italy) – 19 September 2011. ACube Systems is honoured to present the first AmigaOne since 2005: the AmigaOne 500. This is a complete system like the Amiga 500 was, a computer you can use right out of the box. It’s worth mentioning that both Coder from The Bucket Diary and yours truly were hoping for a low-cost, entry-level alternative to the currently available AmigaOS 4 compatible hardware and the upcoming AmigaOne X1000. We must therefore ask the question of how much this new AmigaOne 500 will cost? According to ACube Systems, the computer will set you back 878 EUR or 1062 EUR including VAT. Although it is cheaper than the AmigaOne X1000, we’re talking about a lot of money here. I had hoped for some hardware that would be cheaper than this, which in turn could bring more users to the AmigaOS platform. Still, I must say that it is a cool product featuring the best AmigaOS 4 compatible motherboard available on the market today. Another aspect of this announcement is that there’s now an official line-up of AmigaOne computers coming from A-EON Technology and ACube Systems. Maybe there’ll be more hardware of various forms in this series in the near future? If you read the press release carefully, you’ll see that the headline starts with “File N. 1”.. So, what do you think? What are your thoughts on today’s announcement from ACube Systems? Are you planning to buy the new AmigaOne 500? So, would one purchase an AmigaOne 500 in order to use it as a replacement desktop for everyday use, but instead of using Windows or Linux on a PC, or OSX on a Mac, you use AmigaOS4 on an AmigaOne 500? When I first read the press release I thought – wow, that’s expensive to use as a way to play old Amiga games – but then I realised that Amiga’s were also legitimate business machines for doing day-to-day tasks and multimedia gear. I’ve only used my Amiga 500 to play games, so that probably colours my thoughts on the platform!! 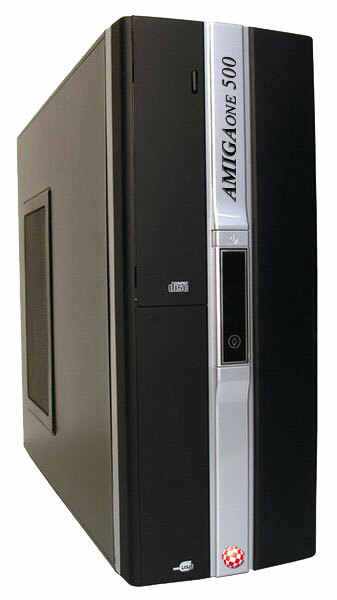 The AmigaOne 500 is a modern computer that is compatible with AmigaOS 4. It is an alternative to the mainstream operating systems out there. You’ve also got the upcoming AmigaOne X1000 which is much more powerful. There are also standalone AmigaOS 4 compatible motherboards for sale (Samantha-series). All boards are equipped with a PPC CPU. This guy shows you some parts of AmigaOS 4.. 😉 Enjoy! That was a big help actually 🙂 I’ll check out the YouTube video you linked to as well!! Thanks, Sean! Good to hear that it was of help. 🙂 Enjoy exploring the world of AmigaOS 4! It is really good to see new hardware is still coming. Eventually it could lead to cheaper hardware. At least there is hardware. 🙂 I am sure there will be a lot of negative comments again on this new hardware. Just the price is something the comment on if you want to point out something but for the rest I am really happy new hardware is still being made. It would be great if this will lead to cheaper hardware becoming available, but only time can tell I guess. 🙂 As you wrote, it’s great that hardware is available for purchase. I remember the time between the release of the AmigaOne systems and the SAM when nothing was being produced. Anyway, I wish all the best of luck to ACube. May you sell a lot of AmigaOne 500 systems so we can se an increase of Amiga users and developers! I also don’t like all those ports. Especially SDL ports. Yes, Jeano has a very good point when it comes to the various ports. The platform needs more native software and stuff that stands a bit out from the rest. This would be very beneficial. Of course you have more software when using SDL to port but I just would love to see some more original software. Take advantage of what OS4 has to offer.